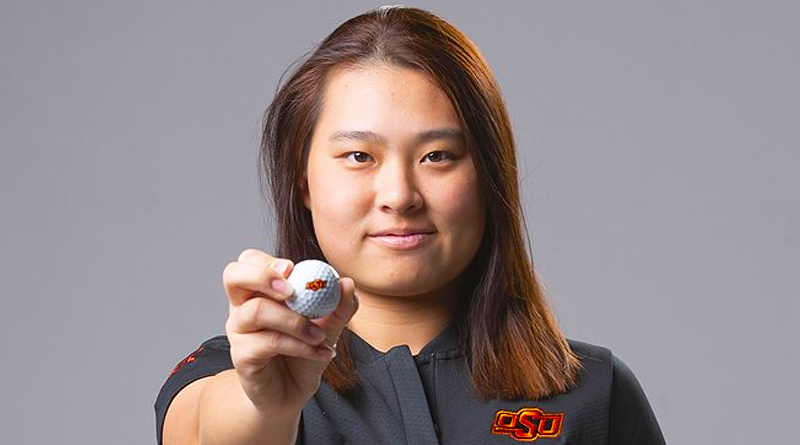 PALOS VERDES, Calif. — In her first round with the Oklahoma State women’s golf team, Han-Hsuan Yu carded a 2-over 73 to finish the opening round of the Northrop Grumman Regional Challenge in a tie for 11th place. One of three Cowgirls playing in their first collegiate events, Yu posted 12 straight holes of bogey-free golf to end spring semester’s opening round just a stroke away from the top 10. Overall, the Cowgirls ended the day at 21-over 305, which puts them in 10th place and only six strokes behind Southern California and Ohio State for third place. UCLA leads the field after day one with a score of 7-over 291. Fellow newcomer Lianna Bailey, the freshman who spent three years after high school playing in amateur circuits around Europe, finished in a tie for 40th after a 6-over 77. She recorded nine pars and two birdies on the day. The other newcomer, freshman Sara Camarena, will enter Monday’s second round after posting 10-over 81. The lone Cowgirl senior, Chih-Min Chen, was just two strokes behind Yu with a 4-over 75. She had eight pars and two birdies and is currently tied for 17th. Sophomore Emma Whitaker is tied for 67th and posted a 9-over 80. The Cowgirls will continue play at the Palos Verdes Golf Club on Monday morning at 11:30 a.m. Central. You can follow all the action at golfstat.com.